3D printer is a device that creates objects by using technologies such as stereolithography, selective laser sintering, fused deposition modelling, multijet modelling or polyjet technology and with materials like ABS, PLA, PC, resins, powders or other suitable materials. 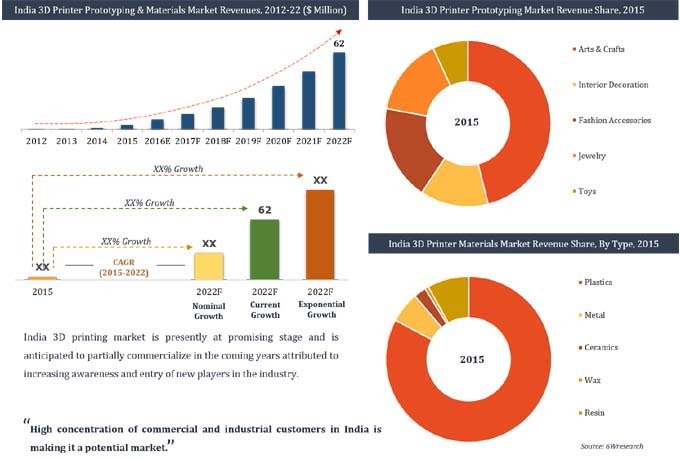 3D printer prototyping service market is expected to gain momentum through the forecast period primarily due to application areas namely, education, medical, arts, accessories and architectural. However, the trend is now rapidly shifting towards industrial & manufacturing application owing to growing awareness and declining prices for industrial 3D printers. 22.2	Altem Technologies (P) Ltd.
22.4	Imaginarium India Pvt. Ltd.
22.7	Objectify Technologies Pvt. Ltd.
22.8	Stanley 3D Tech LLP.